1. Preheat oven to 350 degrees F, and prepare your muffin tins with paper liners. In a large bowl, use a whisk to mix together flour, baking powder and salt. Set aside. 3. Add the vanilla, Blue Moon beer, milk and orange zest. Mix until combined, scraping the sides when needed. 4. With the mixer on low, slowly add the dry flour mixture, mixing until just combined. Do not overmix. Scoop batter into cupcake liners, and bake for 20 minutes or until cake tester comes out clean. Let cool. 5. For the frosting, mix together butter and about half of the powdered sugar with an electric mixer with the paddle attachment. Add fresh orange juice, Blue Moon beer, orange zest and remaining powdered sugar. Mix until smooth. If your frosting is too runny, add more powdered sugar a small amount at a time until you get desired consistency. If frosting is too stiff, add milk, one tablespoon or less at a time. 6. To make the orange garnish, cut ends off of a whole orange and cut into wedges. Place atop finished cupcake. 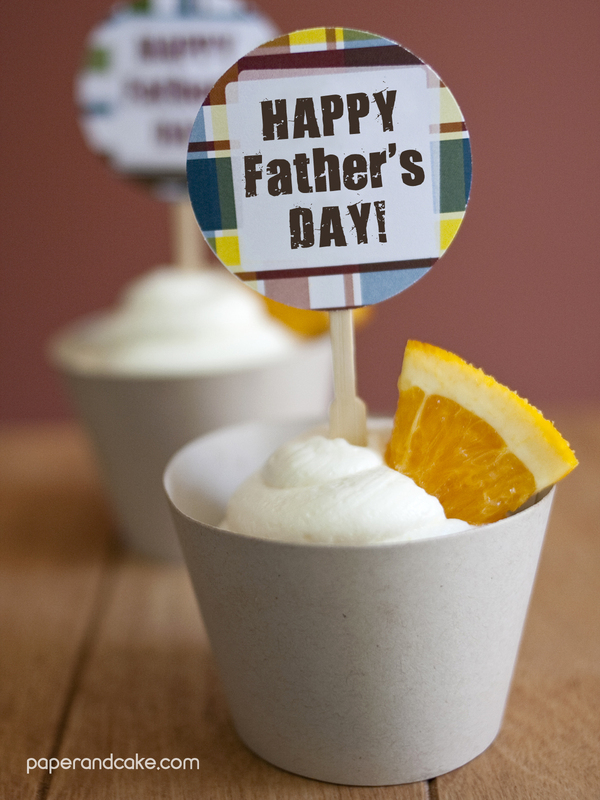 Download your free Father’s Day Cupcake Topper!!! Special thanks to hgtv.com for featuring our beer inspired recipe!